This past week I was honored to have had a truly wonderful and heartfelt letter about me, from Governor M. Jodi Rell, published in the Danbury News Times. I wanted to share with you her very kind words. I am forever grateful to Governor Rell. I was very pleased to read that Dan Carter has decided to run for the U.S. Senate. It was my pleasure to meet Dan when he first ran for the CT Legislature. Since one of the towns he represents is Bethel, a town I represented when I served in the General Assembly, I followed him closely on how he responded to the needs of his constituents. Dan is an honest, sincere and dedicated public servant. He's not flashy, nor does he seek press just to get his picture in the paper or be the headline on the nightly news. 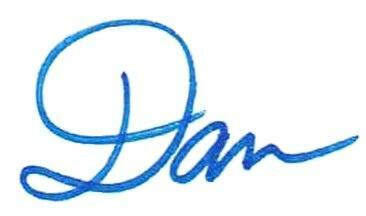 Dan is a hard worker who always does what he believes is right and in the best interest of his constituents. I am proud of Dan and his work in Hartford on our behalf. His strong work ethic would be a great asset in Washington. But we won't hold that against you, Dan!